It's been called the American Riviera. At its heart is Ocean Drive, which has been called the hottest ten blocks on the planet. And if you're after hip sophisticated, there's Lincoln Road, the beautiful pedestrian mall spanning the Atlantic Ocean and Biscayne Bay. It's South Beach, the original Miami Beach...cutting edge modern melded into a place that continually draws you back to a time of glitz, glamour, and class. It sizzles during the day, and it gets even hotter at night...and we're not talking about the tropical temperature! South Beach is in fact one of the most incredible locations found anywhere. And South Beach Marketing was formed specifically to help promote South Beach. South Beach Marketing can assist businesses in a variety of marketing areas, but particularly emphasizes Internet-based approaches to bringing area businesses, activities, and events to a worldwide audience. 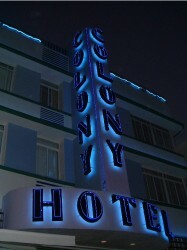 South Beach Marketing is based right in the heart of the art deco district of South Beach. This makes it very easy for South Beach Marketing to work with local businesses. If you need a new photo for your e-commerce web site, South Beach Marketing staff can simply stop by and accomodate you. If you need a flyer scanned and posted online, South Beach Marketing staff can drop by and pick it up. If you need a new entree put into the database for your restaurant web site, South Beach Marketing staff can stop by and listen to your description of the new item. Please take the time to look through the marketing solutions available through South Beach Marketing. Now, more than ever, we all need to focus on marketing South Beach to the rest of the world as a destination that is unparalled in terms of scenery, weather, food, products, services...and of course fun.